Reports: Obama Will Move To Expand Overtime Pay : The Two-Way The president is expected to tell the Labor Department to change the rules about who is eligible. Critics say that might backfire. Proponents say it would narrow income inequality. 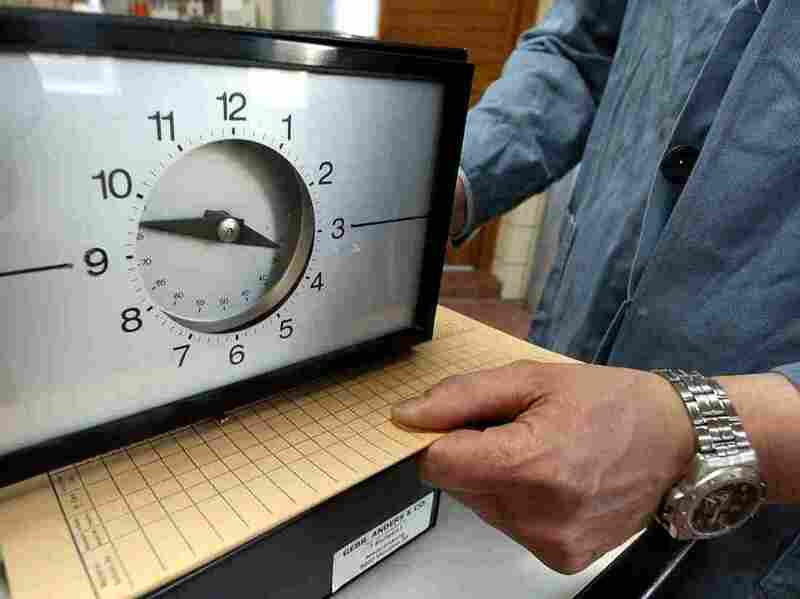 Punching a time card: It's still one way of tracking hours worked. President Obama believes more workers need to be able to add overtime to their pay. The Obama administration's push to put income inequality atop the domestic political agenda has another battlefront. According to The New York Times, the president "this week will seek to force American businesses to pay more overtime to millions of workers, the latest move by his administration to confront corporations that have had soaring profits even as wages have stagnated." The Wall Street Journal says Obama "is expected to order a rule change this week that would require employers to pay overtime to a larger number of salaried workers, two people familiar with the matter said." The announcement is expected to be made Thursday. Obama would direct the Labor Department to make the rules changes. "The directive is meant to help salaried workers, such as fast-food shift supervisors or convenience store managers, who may be expected to work more than 40 hours a week without receiving overtime pay," The Associated Press writes. "For example, the Labor Department could raise the pay threshold for workers covered by overtime rules. Currently, salaried workers who make more than $455 per week are exempt from overtime." "Obama's authority to act comes from his ability as president to revise the rules that carry out the Fair Labor Standards Act, which Congress originally passed in 1938. [President George W.] Bush and previous presidents used similar tactics at times to work around opponents in Congress." Critics, including many who represent business groups, say such an action would increase businesses' costs and discourage them from adding workers.